14 children and one adult have been taken to hospital after around 12 vessels capsized in high winds near Dún Laoghaire Harbour. Up to 100 children had to be rescued when the boats overturned near the West Pier during a children's regatta. More than 80 people were assessed at the scene. A spokesman for Dún Laoghaire Life Boat said it appeared they were mostly suffering from shock and exposure. No one was seriously injured. All of the children were wearing life jackets and all have since been accounted for. 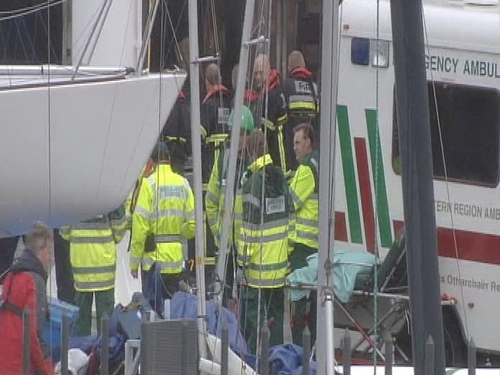 A spokesperson for Dún Laoghaire Harbour Company said that there were 28 knot winds at the time of the incident, which occurred at around 2pm. The large scale rescue operation involved garda air support, the Fire Brigade and a number of ambulances. The LE Aoife is also at the scene. Children from four yacht clubs in Dún Laoghaire and children from other visiting yacht clubs were involved in today's incident. Following the incident, Harbour Road in Dún Laoghaire was closed. Patrick Blaney, the principle race officer at today’s mini-regatta, has said that the event will resume tomorrow. He congratulated emergency services for their rapid response today.